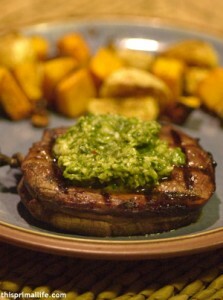 Those who are familiar with The Primal Blueprint eating style already know what is and is not a part of a primal diet. However, from what I have read at the forum on Marks Daily Apple and elsewhere on the Internet, I think most of us vary in how strictly we adhere to the dietary recommendations. Some people eat more dairy or incorporate more natural sweeteners into their diet. Others stick to the guidelines almost without exception. One thing I like about The Primal Blueprint is the concept of sensible indulgences as a part of the eating plan. Even Mark Sisson has a pinch of sugar in his coffee in the morning or some dark chocolate with wine in the evening. This isnt a contest. There is no judgment or guilt. Its about making it work for you and your life. As for myself, I strive for 100% adherence but often fall somewhere short of that depending on the day. One thing I am working on is eating more intuitively and getting over the idea that I should be eating at certain times of the day and not at others. I am also still struggling to get more fat in my diet. I still have residual fear of fat. I find it very useful to read about how others eat following the Primal Eating Plan. Occasionally I get stuck in a rut and need some new ideas. 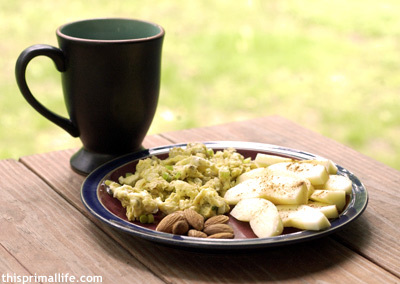 I particularly love it when I stumble across a new breakfast idea, or a great primal snack. Im always grateful when I find a creative take on the standard meat+veggie meal that most primal eaters are pretty familiar with. With that in mind, I thought I would make it a regular feature of my blog to share my menu for a day. I cant promise that the meals will necessarily be creative and inspiring (although I do hope to share original primal recipes in other posts but perhaps youll get a new idea or two, or for those new to primal eating, gain a clearer understanding of what a daily menu might look like. Sugar-free brownie made with coconut flour. I got this recipe from Healthy Indulgences but I lack the dedication to careful measuring that is necessary to good baking so mine are more like dry, brown, vaguely chocolaty lumps. Still pretty good, though, and really filling. Fillet Mignon with turnip greens chimichurri (I used a traditional chimichurri sauce recipe but substituted the turnip greens for parsley because that’s what I had. I think this sauce makes an excellent primal accompaniment to steak.